Tow Away Zone Signs are a useful tool to help meet safety compliance and guidelines. Create a safe workplace and keep employees protected with our No Parking Signs. 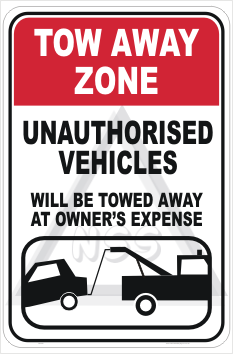 Tow Away Zone Signs manufactured and shipped out of Queensland, Australia. No Parking, Tow Away Zone Sign to drive the message home. This No Parking Sign is available in a 900 high by 600 wide aluminium, steel or plastic form. We can of course, supply smaller sizes. We manufacture these signs ourselves, so you are buying Australian signs, not imported. There are other options you might like to select, such as Reflective and Protective laminate. There are 2 classes of Relective. Class 1 is the diamond grade like you see on the highways in our speed restriction signs. Class 2 Reflective (engineered Grade) similar to the numberplate on your car (but brighter). For this particular Sign, we would recommend Class 2.